toryleadership: Is David Cameron finally emerging as the modernisation candidate? Is David Cameron finally emerging as the modernisation candidate? "I am worried that we will sleepwalk to another defeat if the choice is between staying on a Right-wing agenda, more of the same. That way we will not show we've changed. But on the other hand if we go down a path where we say that the European issue somehow doesn't matter any more, and we're not going to engage in that, I think instead of political suicide, that's national suicide." For "staying on a Right-wing agenda, more of the same," read David Davis and for "national suicide... if we go down a path where we say that the European issue somehow doesn't matter any more," read Ken Clarke. The Telegraph notes: "When it was put to Mr Cameron that he was referring to Mr Davis and Mr Clarke, Mr Cameron made no attempt to suggest otherwise." The Sun and The Telegraph both suggest that Mr Cameron's intervention marks a 'personalisation' of the contest. One "Davis ally" is quoted as saying "We shouldn't be saying things like this, because at the end of the day we're all in one party and after the contest we've got to work together. These personal attacks are not beneficial." The attacks may or may not be beneficial but it is unfair to characterise them as "personal". On both fronts Mr Cameron is questioning the 'political' views of the two perceived frontrunners. He believes that Mr Davis' agenda is too right-wing and that Mr Clarke's European views are out-of-date and dangerous. It is perfectly possible to think that David Davis' speech on social policy means that he is not a right-winger in Michael Howard's narrow mould and that the dead duck status of the euro/ constitution mean that Europe needn't torpedo Mr Clarke's campaign (as it rightly did in 1997 and 2001) but it is perfectly legitimate for Mr Cameron to make the case against his rivals for the Tory crown. After three massive defeats the party needs to understand its electoral plight and not sweep difficult issues under the carpet. Mr Cameron's interview may be a sign that he is finally emerging as the 'moderniser candidate' that everyone expected him to be. Until now his campaign has lacked a compelling theme. The Sun quotes Mr Cameron as arguing for change that is “profound as anything Blair did for the Labour Party”. “If we don’t make changes we’ll go on losing elections,” he says and spotlights Conservative principles on tax, family and defence. During the campaign so far, Mr Cameron has been positive towards George Osborne's views on tax, made conservative noises on marriage and adopted a robust stance on national defence. "I think that instead of political suicide, that's national suicide" - that's a pretty strong charge, isn't it? Whereas he implies (not unexpectedly) that Davis would be unelectable because of being 'Right-wing,' he seems to be suggesting that Clarke is a menace even if was electable. Doesn't suggest he's likely to back Clarke if it comes to a Davis vs Clarke run-off. I'm no fan of David Davis, but it's just a straw man argument to suggest that he constitutes "more of the same". On public service reform, he's way to the economic right of the policies championed by any prior Conservative leader. Whether you like those policies or not, it can't be said Davis offers more of the same. Similarly describing Clarke as "national suicide" is a touch meloframatic, especially as he's about as eurosceptic as Ken Clarke. On many occasions Cameron has said a political and economic European Union is beneficial to Britain, and he has often said Britain does not need to govern itself completely. That doesn't sound euro=sceptic to me. I think these hysterical personal attacks are the sign of a dying campaign. That would be a compelling point if nyone was saying "let's do what Hague and Howard did!" David Davis is 'more of the same' to Joe Public. Approach is as important as policies. Davis' approach is of a combative right-winger which makes him unelectable in the country. Cameron has a far more media friendly approach, which is a good point to have people start to listen to your policies. We need change and we need it now (well ideally a few years ago). "David Davis is 'more of the same' to Joe Public." Prove it. Prove Cameron is "different" to them. How does someone 'prove' an approach? Just take a look at how they come across. Cameron appears moderate, reasonable and professional. David Davis as a combative right winger. Cameron has a lovely typical Tory posh voice. If that's something different - Im not sure its the difference the electorate is looking for. I'm sure he will go down a treat in the cities and urban areas where the party needs to win - like a lead balloon. In what way does Davis come across as combative? This seems to be more and more of an urban myth? If he's comabtive when standing up to the Home Secretary - perhaps we need a bit of that! I've seen Cameron enough times on the media and he does not impress. He's incapable of being precise. He uses strange verbless sentences. He takes amazing false dichotomies and then presents the bloody obvious as if it's a courageous pledge. And he's made zero impact in his Shadow Cabinet post. This week we've had two big eduation stories hit the papers: the failure of the truancy initiatives and the cost of university drop outs. 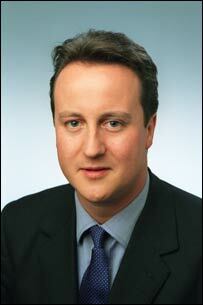 Beyond a CCO press release, Cameron has been notable by his absence - just as he was in exam results season. Lets take a look at who we are against. Blair "appears" moderate and such a lovely person. God forbid we want a leader who would be like Blair! I agree with all the comments which make the point that once this election is over we need to focus our energy on Labour's failing. For me the candidate who is doing that already is Davis - With the Home Office brief he is constantly pointing out the many Labour mistakes. I don't see that as being combative - more like effective leadership. If Blair is so unappealing how come he keeps on winning? The country has spent 13 years voting for a centre-rightish (if class New Labour as such) Government - why on earth would they suddenly go for a right winger? The thing is Nick, Davis isnt the rabid right winger you suggest. Anyone who suggests that Davis will suddenly take the party lurching to the right is wrong. As for Blair winning - I think at the last election Labour one DESPITE Blair - not because of him. Having fought a seat in a traditional Labour area, former mining area etc, I am looking for a Tory who will go down well there, who can win those sort of votes. Frankly those people have had enough of Blair types - New Labour is a dirty word. What we as a party need is someone who can win in areas where we aren't winning - not strengthening our vote in the southern leafy suburbs. "If Blair is so unappealing how come he keeps on winning?" If Blair is so appealing why does he have a minus 13% approval rating (and falling)? He did have a tremendous ability to reach out beyond Labour, but was actually a liability at the last election. Why does he keep winning? Because opposition parties have been no good. Jonathan, I agree on the aims of winning in traditional Labour seats, while I've not been a candidate I am used to campaigning in somewhere very similar to where you describe. The problem is that while as a long term aim seats like that are good our short term chances of government rely on seats like Taunton and Cheltenham. Winning back the Lib Dem areas of the South West and the genuine 'NEW' new Labour seats in the midlands. For them a moderate is far more the order of the day. What I would be looking for is a team from all wings of the party around a new leader - and a leader who can unite the party. I think from the people already signed up to the Davis team indicate he has the support from all wings of the party. From speaking to a certain member of the Lib Dem front bench team I suspect there will be quite a few internal battles for the Libs (such a shame) which will allow us to capitalise on their arguments. I was basically told that there was no way the Libs would move to the right just to ease the worries of the Lib Dems is the South East/West who now fear a Tory ressurgence. This combined with Labour's own leadrship election/coronation has to be good news for us. Not top of your list then ;-) What has he done to deseve that? For me its not actually the leader him/herself that will make teh difference - it will be the ideas and policies they espouse that will make a big difference. "an appeal to those from the centreground"
erm... Willetts isn't from the centreground. He's a right winger, he's just flexible about means. Poor Cameron,I really expected better from him.I think it extremely unlikely he will make the final two and making disparaging remarks about his fellow candidates with whom he will have to work after this is over shows an immaturity of character unbecoming in a shadow cabinet minister let alone a potential leader. A very black mark for Cameron.This makes me rather sad. Nick, what is this silliness about Cameron striking more of a chord with the public than Davis? As Jules said, the public will look at Cameron, think 'typical Tory toff' and decide 'not for me, thanks'. Those that can look beyond this would soon see Cameron for what he is - a Blair wannabe (as pointed out by others above): plastic (just look at the picture accompanying this piece), patronising, all soundbite and no substance, as empty as Nicholas Soames's dinner plate or the seats at 'An Audience With... John Prescott'... People have grown tired of Blair and choosing a clone of him has Conservative leader won't go down well at all I'm afraid. On the other hand, when Davis and chums give the public the hard sell about his background, as they have been throughout the leadership contest, the public will see somebody they can identify with. "I can't believe this - I actually find myself agreeing with James Hellyer instead of Nick for once"
Oi! There's nothing wrong with agreeing with my Commonsense brand of Conservatism. Not much to add to the previous discussion. While it's fairly gentlemanly "mudslinging", it does indicate a measure of desperation on DC's part. He really needs to think very hard about when he's going to declare for his chosen front-runner. Because this sort of thing is not helpful to him, or more importantly, the party. Well people keep insisting Cameron is bound to link up with Clarke eventually but if the repeated jibes about his age didn't burn that particular bridge, it would seem that Cameron has taken a blowtorch to it with his latest attack. The Davis Dash and Fox Trot seem more likely, although the attack on rightwingers won't have helped. Surely he's not considering hooking up with Rifkind (or 'Ratkind' as someone rather harshly referred to him elsewhere on the site)? Cameron did ok on GMTV this am but Fox was better and I like both of them. I particularly like the way that Liam Fox is saying 'this is me and what I personally believe in' BUT I'm a member of a party who will all have their say and shouldn't the leadership election be about ME (for the only time in office) how can you judge people if don't know much about them - you can only go off impressions - talking of impressions I wonder if Simon Cowell was asked about who came out top in Media image just between Clarke and Davis and they didn't include Fox or Cameron in the options? The other smart point Liam Fox made this morning was over the West Lothian question and he confirmed my particular belief that now certain decisions have been devolved to Scotland and Wales e.g Tuition Fees, Scottish and Welsh MP's should not vote on those issues for England. It may be because of my shock at agreeing with James Hellyer, or possibly due to drinking too much red wine (I assure you, the two events are unrelated!) but I forgot to comment on the staggering hypocrisy of Cameron last night. How on earth can you take seriously a man who, in one breath says we should move away from 'more of the same', and in the next breath reaches for the 2001 election hymnsheet (author: W. Hague) and belts out another rendition of the Eurosceptic Scaremongering Psalm?